Scott Youngblood (Pare) is a Marine with an impeccable record - a true American hero. When he hears that his sister Kim (Bridges) is in trouble and mixed up with evil gangsters/drug runners Dutch (Del Amo) and Silke (Avoth), he travels to Madrid to save her. Sadly, he’s too late. Dutch and Silke killed her, as part of their phony modeling/prostitution scam. Now burning with revenge, he finds a contact in Spain, Jake (Crook) and together they go looking for Dutch and Silke. Meanwhile, since the death of Kim, a new model has come in to take her place, Virginia (Kitaen), but Youngblood tries to rescue her from her dismal fate. 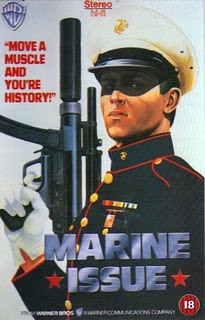 Because Youngblood is a model Marine, he realizes some of his tactics may be contrary to the code of ethics of the Corps, so he goes to Maj. Davis (Napier) and resigns. Davis is confused, but warily trusts Youngblood. Now totally rogue, Youngblood is free to dispense some INSTANT JUSTICE. You’ve heard of Instant Oatmeal. Now prepare yourself for Instant Justice. Pare puts in a Dolph Lundgren-esque performance as the wooden, no-nonsense Youngblood (you gotta love those hero names). 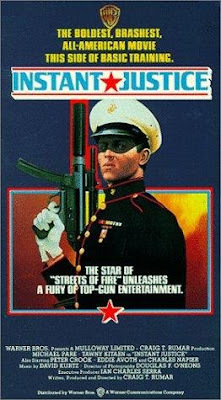 The fact that he’s the ultimate Marine allows for some classic 80’s patriotism along with the barfights and one-liners. Not to mention the car chases with rockin’ guitar solos. It’s nice to see Tawny Kitaen, who doesn’t appear in a lot of these types of movies, along with familiar faces like Napier and Pare. Kitaen’s hair certainly typifies the “big” style of the time. This was Director/writer/producer Craig Rumar’s only film to date. Surely he was inspired by the action boom of the day. His story of a lone hero who tries to go to the authorities and go through the proper channels but comes up against maddening bureaucracy and has to take on the baddies alone is always a nice story to see. But, it must be noted that one Anthony "Tony" Bingham steals the show as Sgt. Walker. For no conceivable reason, Pare tells him he has stains on his uniform. Bingham’s line, delivered in a way that is a classic for the ages, replies, and I quote, “My hamburger spilled ketchup”. I’ll just let you mull that over in your mind for a while. We rewound that great cinematic moment. Youngblood is a man of action with an 80’s soundtrack behind him (not the least of which is “Danger in the Streets” by Lee Hart). 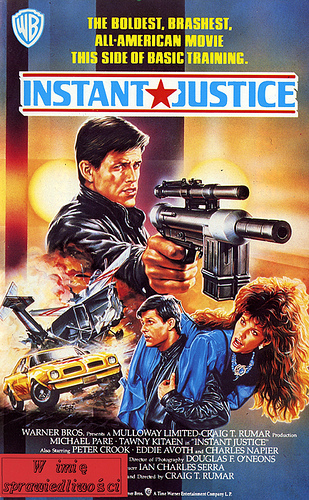 While maybe some of the talkier/unnecessary bits could have been trimmed, making the movie just a bit leaner and meaner, Instant Justice is a decently entertaining and typically-80’s action film - and that’s just what we’re normally after. I read your review of the movie Instant Justice and I appreciate your comment regarding my performance of Sgt Walker. At the time, I was assigned to Torejon AB (just outside of Madrid, Spain) while serving in the US Air Force. I was lucky enough to get involved getting this role and had a lot of fun doing it. I also had one other scene where Michael Pare's accomplice crashes through the gate, I'm the one shooting at them and jumping out of the way of the gate as the car crashes through it. Thanks to Tony Bingham for this contribution. "You’ve heard of Instant Oatmeal. Now prepare yourself for Instant Justice". Sold. Happy you liked it! Looking forward to your take on it. Michael Pare is hilariously wooden in it! Remember seeing this in the video shop way back when but I never did rent it, it sounds fun from your review! It is a lot of fun! Gotta Love Pare! I just put this in my Instant Queue like ten minutes ago, and then I come over here and see that you've reviewed it. What a coincidence. I've been meaning to get more Pare up, and this looks like a good bet. Fantastic review! A very interesting looking film that I have not seen, and nice looking blog! DTVC: What a odd coincidence. If you like Pare, you will definitely enjoy it. Looking forward to your opinion on it! Matt S.: Thanks for the kind words! That's so funny! I had put this in my instant queue months ago but still have not gotten a chance to see it. Too many movies, too little time! Actually sounds better than I was expecting. Thanks man! Great review! I know! We never have enough time to watch everything. Also Looking forward to your take on the movie, robotGEEK! Michael Pare is always entertaining.